If you have sagging skin, you don't have to run off to a plastic surgeon. Here are my favorite tricks and tips that, unlike a facelift, cost little or nothing. I have friends in their 30s with jowls. This is what happens when you have loose skin or fatty deposits under your chin. To get rid of this permanently, you would need a professional to either perform lipo on your chin if you have fatty deposits. But you don't have to run off a doctor. There are much cheaper ways to conceal saggy jowls. The answer here lies in jewelry selection. Stay away from chokers and short necklaces which draw eyes straight to the jawline. Bring up the eye by wearing gorgeous earrings instead. You can also draw attention away from the neck area by making up your eyes. With your eyes getting all the focal attention, people won't notice your jowls. See How to Apply Eye Makeup in Just 8 Steps. When it comes to crepe-y necks, it's all about bobs, but longer than the chin-length ones. A bob that hits just below the chin will draw attention away from your neck. You want to avoid longer cuts because they attract the eye downward. Also, consider wearing scarves wrapped several times around the neck. Very European. Get inspired by Celebrities Over 50 With Gorgeous Hair. Don't apply blush to the apples of your cheeks only or you risk looking like a clown. Instead, choose a rosy blush and using a large fluffy brush, sweep color over the highest point of your cheekbones. Start about an inch in from the nose. Dewy skin is always youthful. 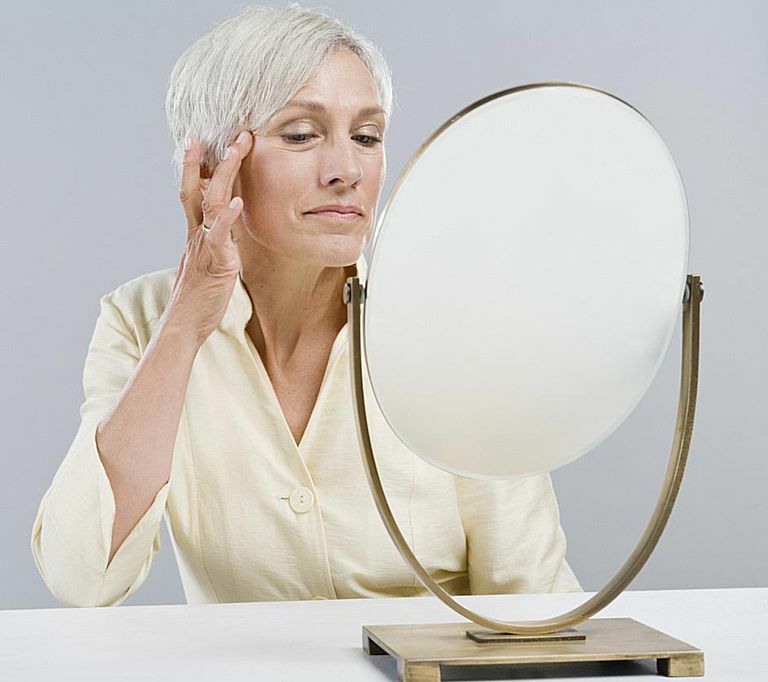 Because aging skin tends to be dry, skip the powders and opt instead for liquid foundation and creamy blush. Pat skin with a pea-sized amount of moisturizer after makeup application to create "dewy skin." See 20 Foundation, Concealer & Blush Tips That Will Change Your Life.